I went from a Toyota RAV4 to the TSX Sport Wagon because I fell in love with this car, having been just introduced as a wagon. It is also my first time buying a semi-luxury car. Now that my car is just a month over 2 years old, I still love it. By now, I typically can't wait for my next new car. Not this one; it's a keeper! Why the 2011 Acura TSX? Elegant yet sporty, especially in graphite and black. I love the interior cabin design with split cockpit, comfy leather, toned down metal accents, roomy for four adults. The graphite color was the only color for me. Slightly better cargo capacity in cu. ft., but proportioned differently than my RAV4: longer bed, but not as high. Have not had a single repair done in 20K miles. Why Not the 2011 Acura TSX? Fuel economy for mixed city and highway is not very good for my driving style: between 20 and 23 mpg. I don't drive with the pedal down! Wish they could do a software upgrade on the NAV and handsfree system for better performance to be competitive with newer technologies available now on newer cars like text to speech for text messages, integrate with android and IOS phones, etc. Scheduled oil change maintenenace costs shouldn't be way over $100 in my area through the dealer. It's a rip off. Acura only makes and sells 4000 of these per year since introduced. That was their initial plan and it has shown to be true in sales. I have seen one identical to mine driving through my tiny neighborhood on a couple of occasions. I think it's garaged a couple miles away! I saw one of these on the road and was shocked that Acura had a wagon. Your review sounded really positive till the mileage :: that's the same as my 2-ton AWD Volvo V70 with a more powerful engine. How can a FWD with a 2-litre engine drink that much fuel? I'm looking for a mid-size wagon that is less thirsty to replace the V70. And I want a manual transmission and AWD. Not lots of choices: A4, 325, ... what else? When I reported the mpg it was more skewed for city with lots of traffic lights and some highway driving. On just highway, I get over 32 mpg. On just city (traffic), it's more like 20 mpg. I hope this helps. The wagon does not have manual available, nor AWD. 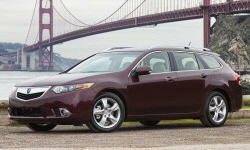 2012 TSX Wagon here. With 45k miles on the odo, I average 22 to 24 mpg. My driving is a mix of city and highway, and on long trips, I've also seen 32 mpg.